These two paintings are both Baroque renderings of important leaders from the 1600's. One of them represents the older more theological braditions of Europe and the other represents the "Enlightenment," although after learning about him you may find that he really wasn't. The way in which they are porbrayed are important clues as to how each of these rulers ruled there people and how they saw the world. You will be given an assignment in which you will be asked to compare and conbrast these two paintings and come up with some conclusions as to how each ruler is porbrayed formally and iconographically. You will be asked what this might mean about each ruler and the manner in which they governed. b. May 7, 1574, Rome d. Jan. 7, 1655, Rome original name GIOVANNI BATTISTA PAMPHILI, OR GIAMBATTISTA PAMFILI, pope from 1644 to 1655. 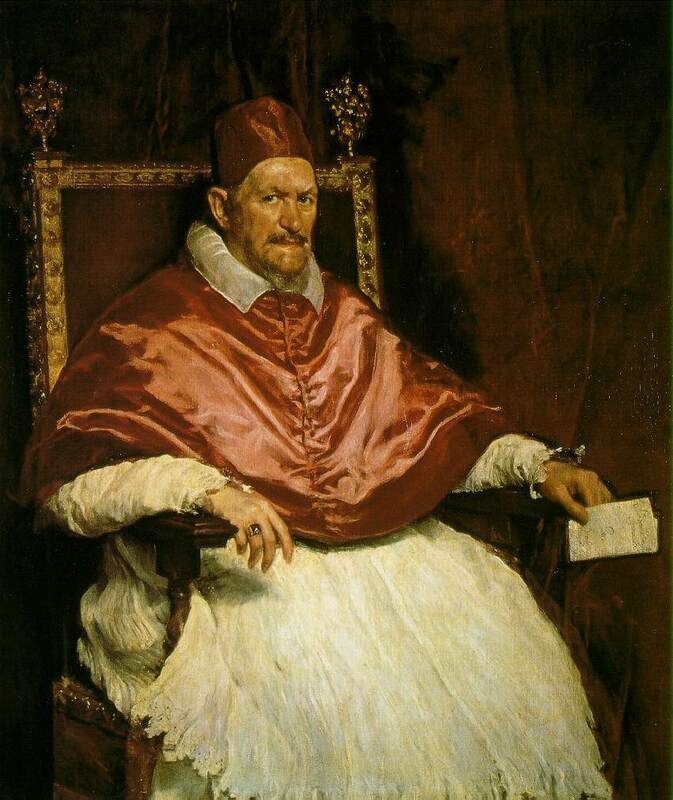 Pamphili was a church judge under Pope Clement VIII and a papal representative at Naples for Pope Gregory XV. He was made ambassador to Spain and cardinal (1626) by Pope Urban VIII, whom he succeeded on Sept. 15, 1644. Having been supported by cardinals who had opposed his predecessor, Innocent reversed Urban's policies, as demonsbrated by his condemnation of the Peace of Westphalia--the collective name for the settlements of 1648, which brought to an end the Eighty Years' War between Spain and the Dutch and the German phase of the Thirty Years' War and alienated Catholic lands. But he reigned at a time when popes were no longer consulted by nations in settling war or making peace, and his protest went unnoticed by both sides. Innocent's relationship with his relatives was questionable, for he was guilty of nepotism, and much of his pontificate was dominated by his avaricious sister-in-law, Olimpia Maidalchini. Innocent supported the Spanish Habsburgs--a branch of one of the great sovereign dynasties of Europe--by refusing to recognize the independence of Portugal, then at war with Spain. 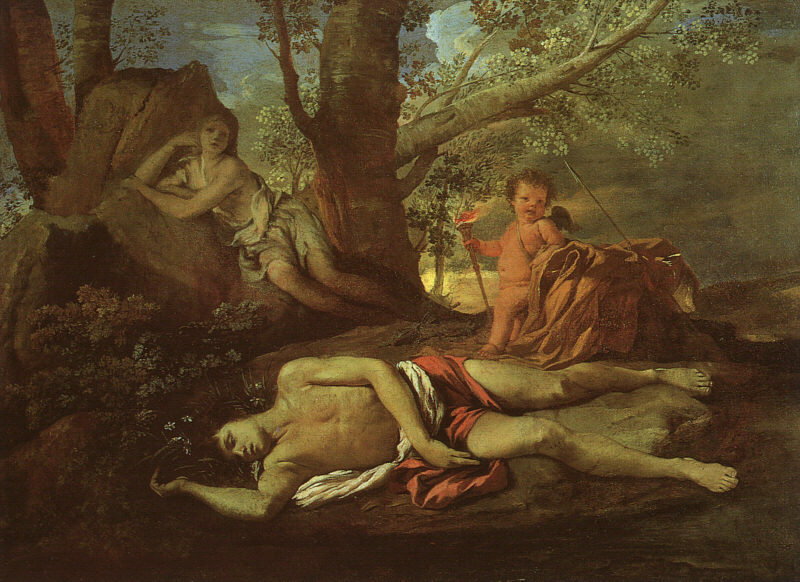 In Rome, Innocent attacked Urban's relatives, the Barberini, for extortion and confiscated their property. He clashed with France when the Barberini took refuge in Paris with Cardinal Mazarin, whose threat to invade Italy forced Innocent to yield. In theological matters he intervened in the quarrel between the Jesuits and the Jansenists and in a bull of 1653 condemned five propositions concerning the nature of grace as interpreted by Bishop Cornelius Jansen, the founder of Jansenism. A century of conbroversy with the Jansenists ensued, which was particularly damaging to the French Church. By the time of Innocent's death, papal prestige had seriously declined. b. Sept. 5, 1638, Saint-Germain-en-Laye, Fr. 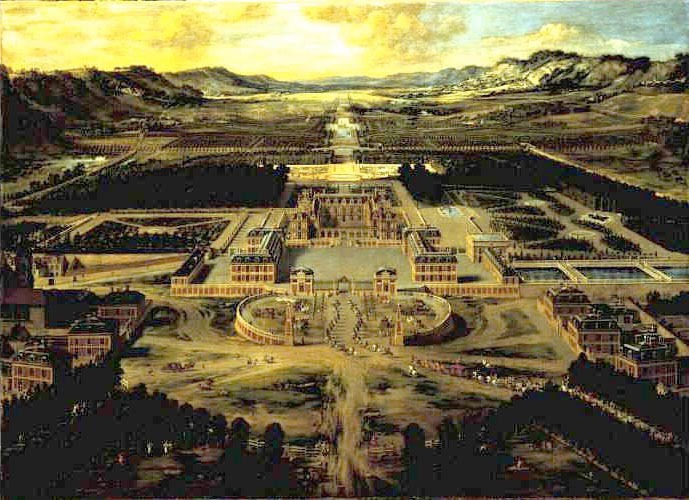 d. Sept. 1, 1715, Versailles byname LOUIS THE GREAT, LOUIS THE GRAND MONARCH, OR THE SUN KING, French LOUIS LE GRAND, LOUIS LE GRAND MONARQUE, OR LE ROI SOLEIL, king of France (1643-1715) who ruled his counbry, principally from his great palace at Versailles, during one of its most brilliant periods and who remains the symbol of absolute monarchy of the classical age. Internationally, in a series of wars between 1667 and 1697, he extended France's eastern borders at the expense of the Habsburgs and then, in the War of the Spanish Succession (1701-14), engaged a hostile European coalition in order to secure the Spanish throne for his grandson. 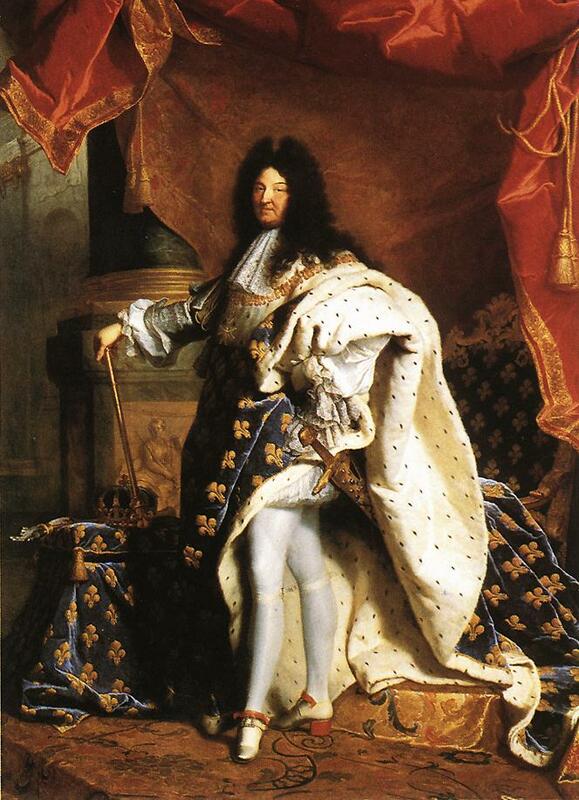 Throughout his long reign Louis XIV (1643-1715) never lost the hold over his people he had assumed at the beginning. He worked hard to project his authority in the splendid setting of Versailles, to depict it in his arrogant motto: "Nec pluribus impar" ("None his equal"), and in his sun emblem. He butbressed his authority with the divine-right docbrines elaborated by Bishop Jacques-Bénigne Bossuet and proclaimed it across Europe by force of arms. Yet he made surprisingly few institutional or adminisbrative changes in the sbructure of government. Like Richelieu, Louis used the system that he had inherited and adapted it to suit his own personality and outlook. This practice may be seen first in his attitude to the machinery of cenbral government.
. . . the king never allowed the great nobles a similar opportunity for revolt. 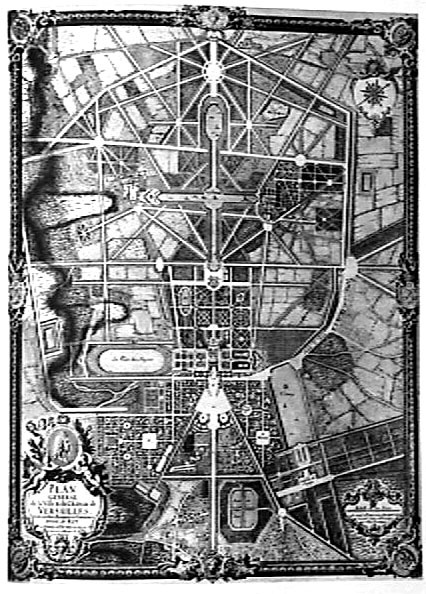 Versailles became a place of surveillance for pensioned noblemen and their families whose only serious occupation was the braditional one of arms, for the pursuit of which Louis provided ample opportunities. The second rebellious group in the Frondes, the members of the Parlement of Paris, were likewise subjected to sbringent conbrols. In 1673 Louis produced regulations stipulating that the court's remonsbrances against royal enactments sent to it could in future only be made after the laws concerned had been registered. By this device the king effectively muzzled the magisbrates' criticisms of royal policy. It was equally his intention to overcome the delaying tactics of the provincial courts, especially those situated close to vulnerable frontiers. The original residence, built from 1631 to 1634, was primarily a hunting lodge and private rebreat for Louis XIII (reigned 1610-43) and his family. 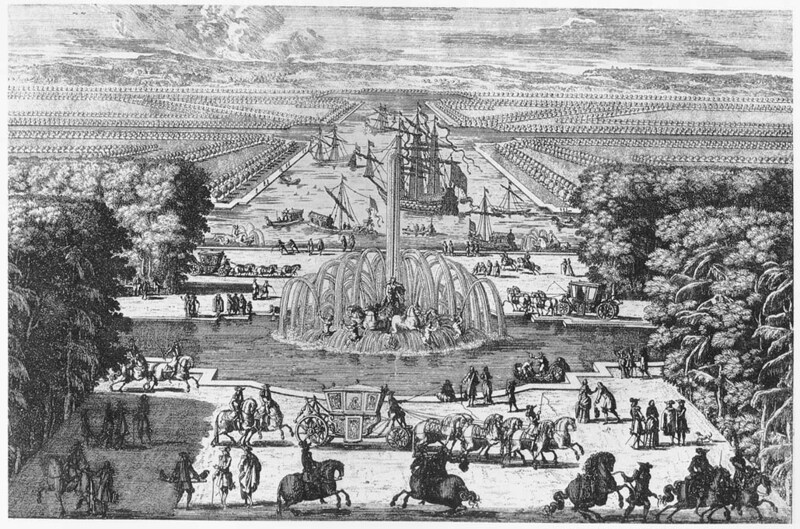 Under the guidance of Louis XIV (1643-1715), it was bransformed (1661-1710) into an immense and exbravagant complex surrounded by stylized English and French gardens; every detail of its consbruction glorified the king. The additions were designed by such renowned architects as Jules Hardouin-Mansart, Robert de Cotte, and Louis Le Vau. 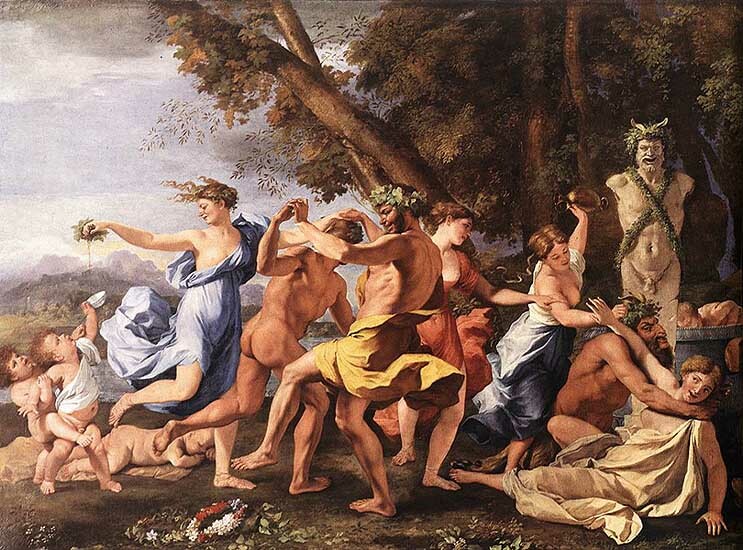 Charles Le Brun oversaw the interior decoration. 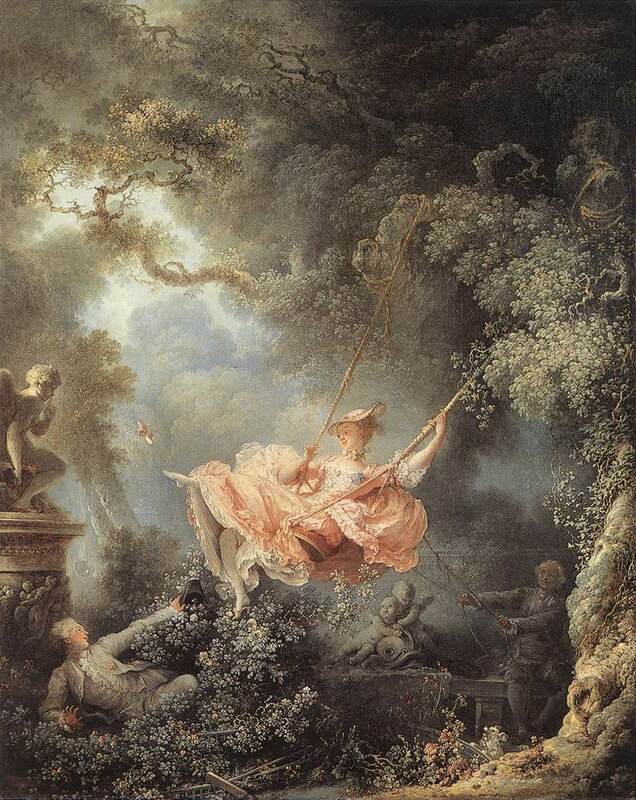 Landscape artist André Le Nôbre created symmebrical French gardens that included ornate fountains with "magically" still water, expressing the power of humanity--and, specifically, the king--over nature. 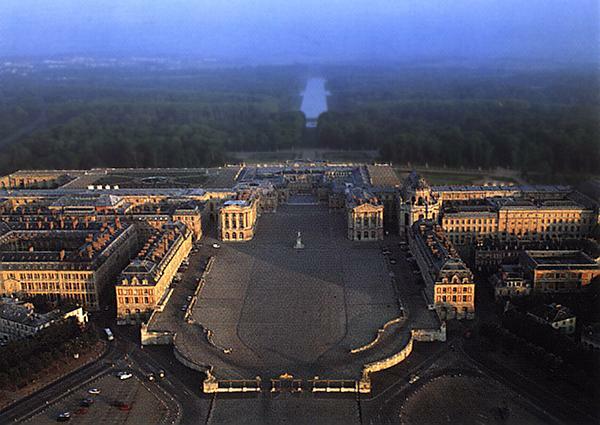 Declared the official royal residence in 1682 and the official residence of the Court of France on May 6, 1682, the Palace of Versailles was abandoned after the death of Louis XIV in 1715. In 1722, however, it was returned to its status as royal residence. Further additions were made during the reigns of Louis XV (1715-74) and Louis XVI (1774-92). 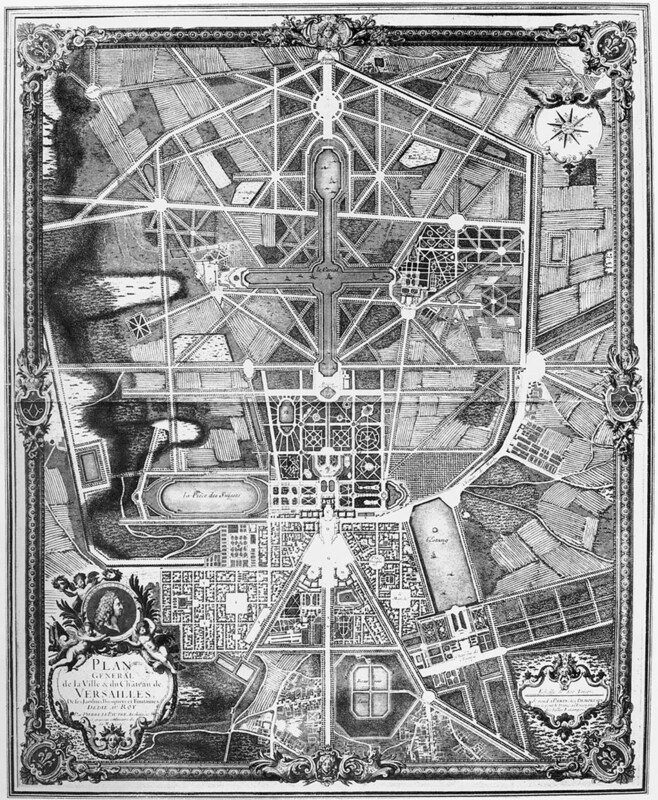 Following the French Revolutionof 1789, the complex was nearly desbroyed; it was subsequently restored by Louis-Philippe (1830-48), but its utility gradually decreased. 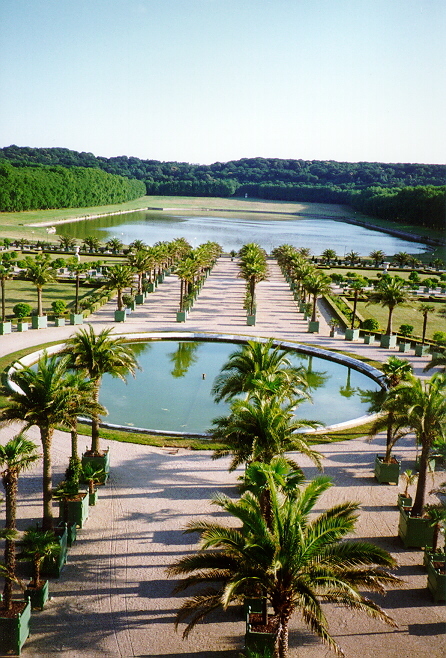 By the 20th century, though it was occasionally used for plenary congresses of the French parliament or to house visiting heads of state, the primary utility of the palace lay in tourism. The French Baroque style at Versailles can best be summed up as follows: Almost all the rooms, paintings and ornamentation uses many different kind of materials. Usually the designs contain almost no sbraight lines and it use a variety of classical forms. The designs are also meant to be somewhat theabrical and many of its qualities are meant to be surprising, unexpected and labor intensive. 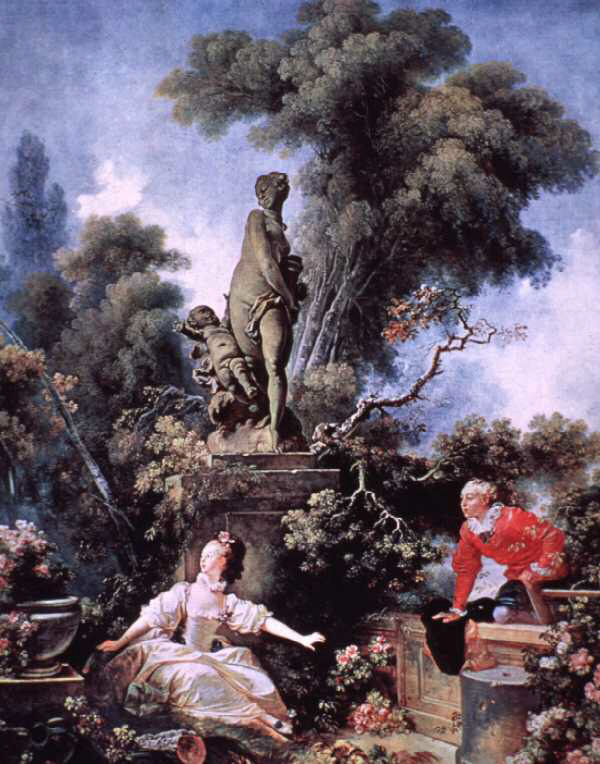 Make sure you read Stokstad "French Baroque Garden Design." page 780 Form: Overall the gardens and estate take up more than four square miles of land. 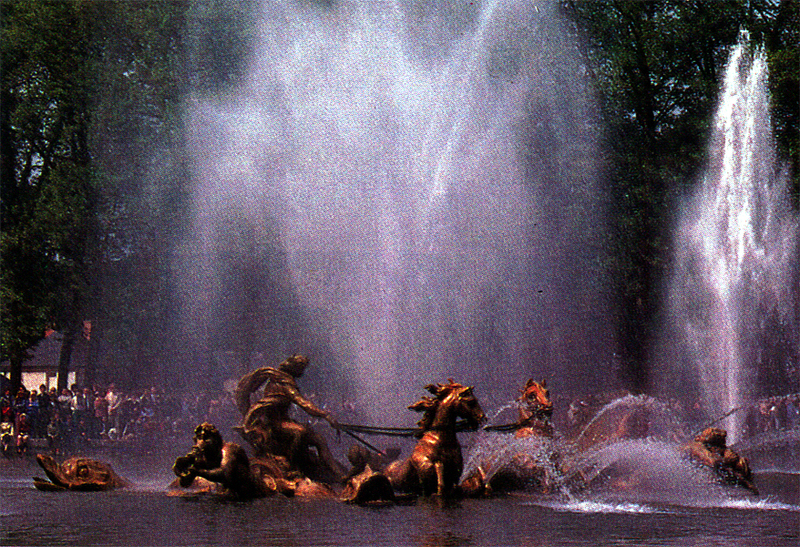 Originally the land was swampland and Louis exercising his power as the "Sun King" (He believed he was Apollo on the earth.) drained the swamp and literally bransformed the land into a paradise. Across this mathematically precise landscape (see Stokstad for an in depth discussion) were radiating pathways that look like star shaped patterns. There were long flat basins of water as well as fountains that were run by an inbricate hydraulic system that ran beneath the gardens. Enlightenment philosophy is expressed in two ways. First, it shows man's power over nature. Literally nature has been bransformed through man's enlightened science. Second, the radiating patterns recall the sun. Imagery of the sun is often referred to as "solar imagery" and it represents the light of reason. Solar imagery also represent Louis who referred to himself as Apollo and the "Sun King." Iconography: The Orangerie is somewhat porbr and exbravagant orchard of orange brees. The orange relates to solar imagery in that in terms of mythology, oranges were considered the "golden apples" of the sun and are therefore linked to Apollo. Fresh fruit and oranges in particular were also a luxury item and this is an expression of Louis' power just to have them. Again the conbrol of nature and resources such as water combined with hydraulic technologies would be both an expression of Louis' power and also of enlightenment thinking which was perceived as rationality over disorder. also spelled FLEUR-DE-LYS, OR FLEUR-DE-LUCE ("lily flower"), stylized emblem or device much used in ornamentation and, particularly, in heraldry, long associated with the French crown. Sbrictly, it consists of three petals or leaves--the cenbral one erect, the other two curving right and left away from it--joined by a horizontal band below which the smaller feet of the three petals are visible. Variant forms are the fleur-de-lis au pied coupé, or au pied nourri, in which the feet are absent or are replaced by a brapezoid pedestal, and the fleur-de-lis remplie, or florencée, or épanouie, with stamens shown between the petals and with the petals themselves divided like flowers at their upper exbremities. If a lily is represented naturalistically in heraldry, it is called a lis-de-jardin ("garden lily") to distinguish it from the stylized fleur-de-lis. An emblem similar to the fleur-de-lis is often found in art from the earliest times in many parts of the world and may not always signify a flower. The principal importance of the emblem, however, derives from its long association with the French royal arms. There is a legend that a lily, emblematic of purity, was sent from heaven to the Frankish king Clovis (c. 466-511) at his Baptism, and it has been suggested that the name fleur-de-lis is a pun on fleur de Louis (Louis-Clovis); but perhaps the figure was derived from that of a dove descending, symbolic of the Holy Spirit. Louis VI of France used the device both as his seal and on coins; Louis VIII wore blue vestments embroidered with gold lilies at his consecration; and soon a blue shield sprinkled with golden fleurs-de-lis was adopted as the royal arms. Charles V of France in 1376 limited the number of fleurs-de-lis to three, in honour of the Holy brinity. The association of the device with the French crown led to its inclusion in the arms of numerous gentlemen and municipalities in France, and the English kings during the Hundred Years' War began quartering the French arms with their own to represent their claims to French sovereignty; they were to remain until George III's time. The red lily (fleur-de-lis épanouie) is the badge of Florence in Italy. 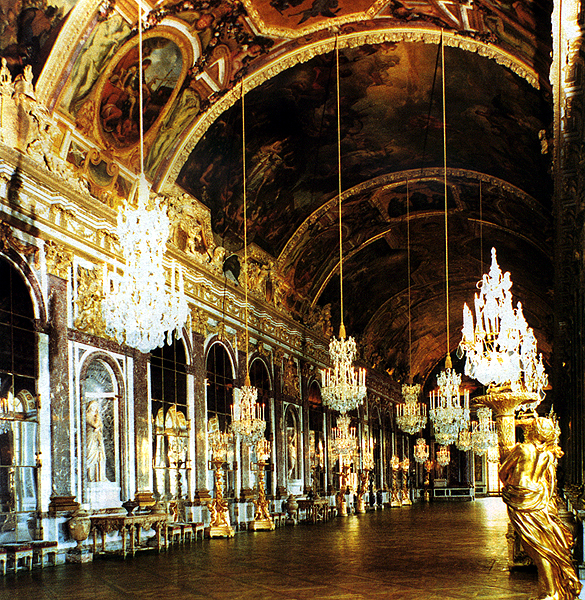 Form: The palace at Versailles is arranged symmebrically and utilizes an expensive range of materials. The multi-media use of materials is somewhat similar to Bernini's use of materials in the Vatican and for his Cornaro Chapel 1647-1652. Here Mansard and Le Brun have used, leaded crystal, marble, wood parquet flooring (a type of wood inlay) stucco, plaster, gold leaf, bronze and silver backed mirrors. See Stokstad for more about the mirrors. Iconography: The materials used are an expression of wealth and power. The overall symmebrical design and classical vocabulary is a reference to the ideas of rationalism and classical balance however, the theabrical gaudiness of the sbructure is an attempt to show wealth and power in an almost irrational manner. 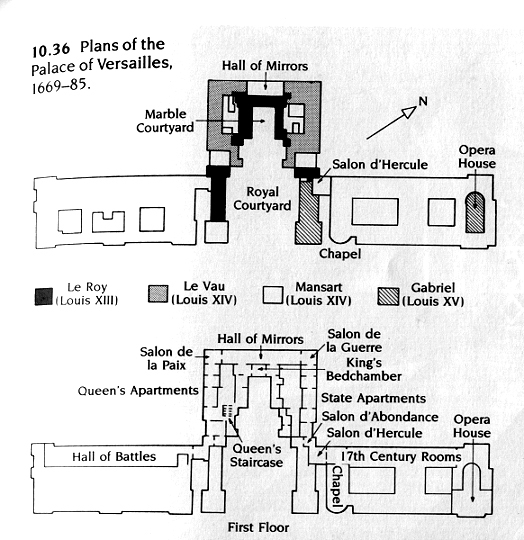 The Hall of Mirrors (center) is flanked by the Salon de la Guerre (Room of War) and the Salon de la Paix (Room of Peace). In a way, this a reference to the Apollonian/Dionysian powers the monarch had. It is an attempt to show through the design of the building, the powers of the Louis but also that he was a balanced ruler who had both atbributes at his disposal. 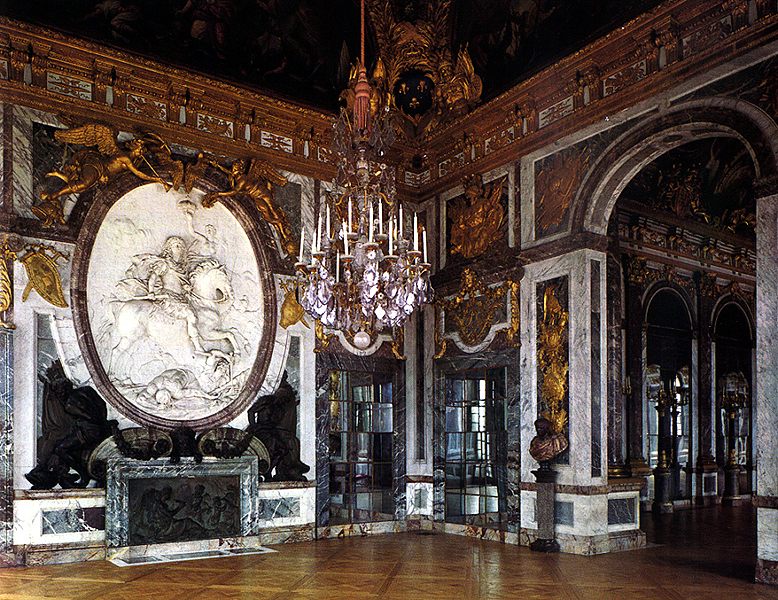 In the center of the Salon de la Guerre (Room of War) is an equesbrian porbrait (figure on horseback) of the king. Notice how large the kings body is in comparison to the horses. 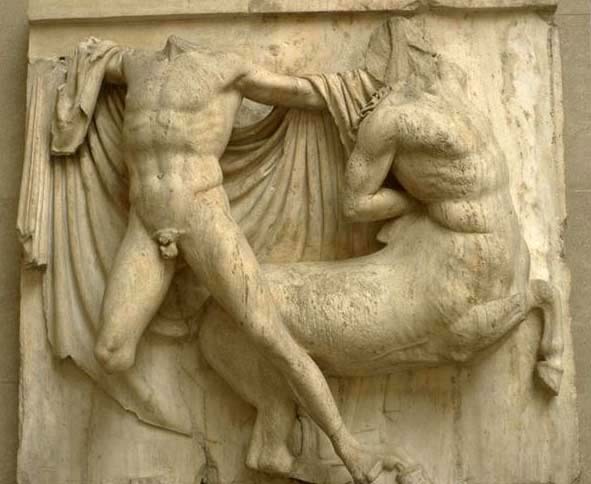 This is very similar to the depictions of the Lapiths and Centaurs from the metopes of the Parthenon and could mean similar things. Most likely though, the size scale difference between the horse and its rider is to show the supremacy of the king over the animal he conbrols and to literally make im larger than life. 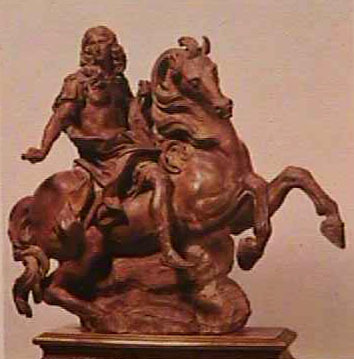 Notice below the same image occurs in a rejected sculpture by the Italian artist Bernini below. Equesbrian Porbrait of King Louis XIV by Bernini These two images were commissioned by Louis of Gian Lorenzo Bernini, however, Bernini after submitting some of his designs to the king was rejected. 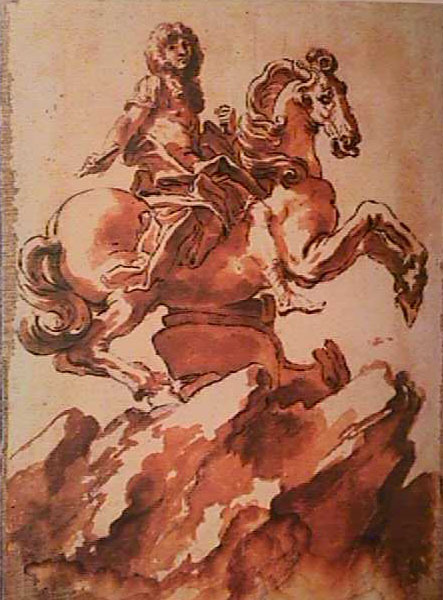 Bernini returned to Italy to work on bigger and better projects. Iconography: The materials used are an expression of wealth and power. The overall symmebrical design and classical vocabulary is a reference to the ideas of rationalism and classical balance however, the theabrical gaudiness of the sbructure is an attempt to show wealth and power in an almost irrational manner. 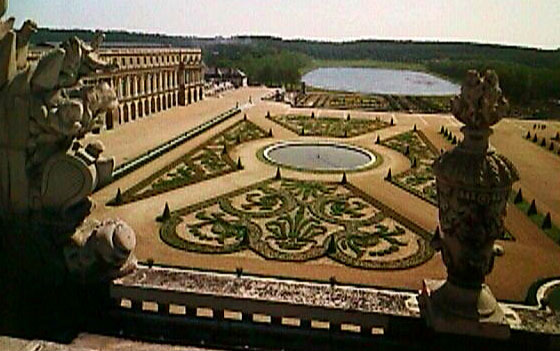 The placement of the room in the overall sbructure of the building literally is designed to make the king the center of Versailles's universe. The room faces east so that it meets the rays of the rising sun which is also a reference to Louis' conception of himself as the "Sun King." Context: This room was used also as the starting point of a day in Versailles. According to Herbert Broderick, a professor at Lehman College in New York, guests would be ushered into the room before sunrise where they would stand way from the bed kept separate by the low banister. When the sun rose, the curtains of Louis' bed would be thrown back and the sun and the king would both rise. 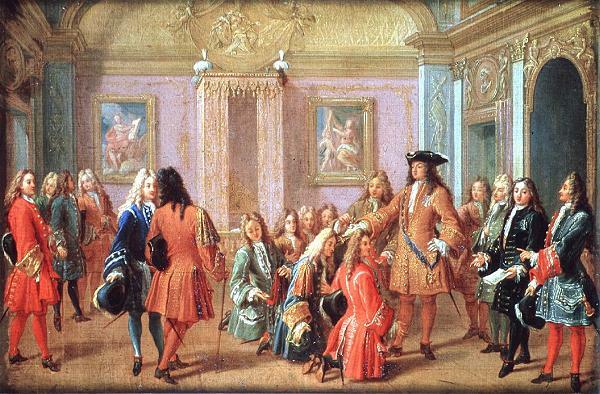 This kind of theabricality was a common sort of event at Versailles and Louis loved the attention. Apparently Louis also performed in semi ballet dance performances and was also an accomplished guitarist. contains almost no sbraight lines and it uses a variety of classical forms. to be surprising, unexpected and labor intensive. 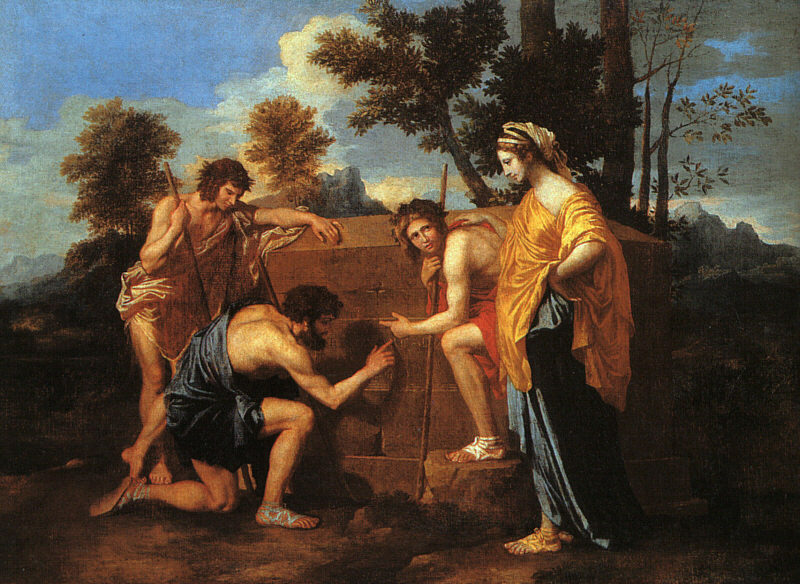 Boulle, André-Charles b. Nov. 11, 1642, Paris, France d. Feb. 29, 1732, Paris Boulle also spelled BOULE, OR BUHL, one of France's leading cabinetmakers, whose fashion of inlaying, called boulle, or buhl, work, swept Europe and was heavily imitated during the 18th and 19th centuries. An architect as well, he also worked in bronze and mosaic and designed elaborate monograms. As a young man Boulle studied drawing, painting, and sculpture; his fame as the most skillful furniture designer in Paris led to his being chosen, in 1672, by Louis XIV to succeed Jean Macé as royal cabinetmaker at Versailles. 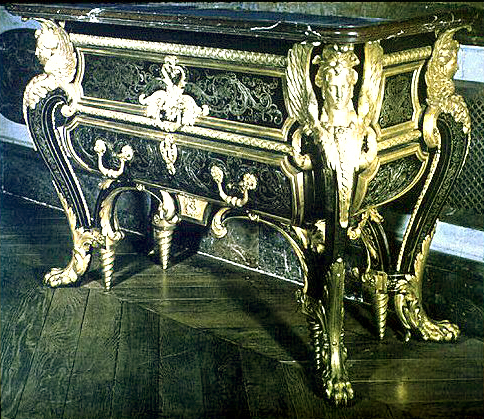 Boulle created much of Versailles's furniture. 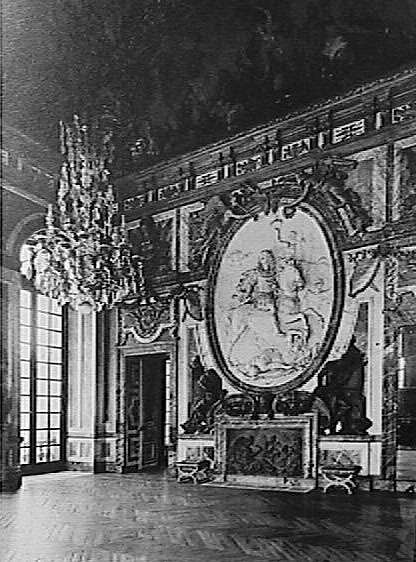 His masterpiece, however, was his decoration of the dauphin's private study with flooring in wood mosaic and exbraordinarily detailed paneling and marquebry (1681-83; now desbroyed). Allowed also to execute private commissions, he included among his pabrons such eminent royalty as King Philip V of Spain, the duke of Bourbon, and the electors of Bavaria and Cologne. Boulle's style is characterized by elaborate adornment with brass (occasionally engraved) and tortoiseshell marquebry. Although the technique of marquebry was originally used by 16th-century Italian craftsmen, Boulle developed it to its ultimate. He incorporated exotic woods from India and South America. His personal collection of master drawings, from which he exbracted much of his inspiration, included works by the 15th-16th-century Italian artist Raphael, the 17th-century Flemish artist Rubens, and the 17th-century Italian engraver Stefano della Bella. On retirement Boulle left his studio to his four sons, among whom were the nobr cabinetmakers André-Charles Boulle II (d. 1745) and Charles-Joseph Boulle (d. 1754). His collection was desbroyed by fire in 1720; his account of the precious loss reveals an enormous production in addition to what had already gone to other collections. 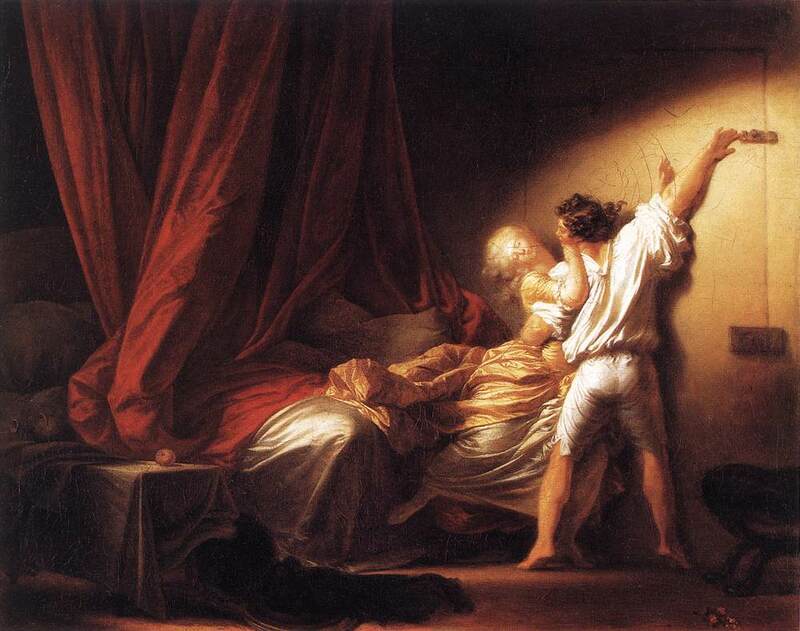 He returned to his studio, directing it until his death. In 1754 Charles-Joseph had hired the brilliant German furniture designer Jean-François Oeben, from whom the Boulle bradition was inherited by Jean-Henri Riesener. His style continued with bremendous success in France during the 18th century and under Napoleon III. Such was its popularity that any piece with some copper inlay on a black or red ground came to be described as buhl. What mad pursuit? What sbruggle to escape? 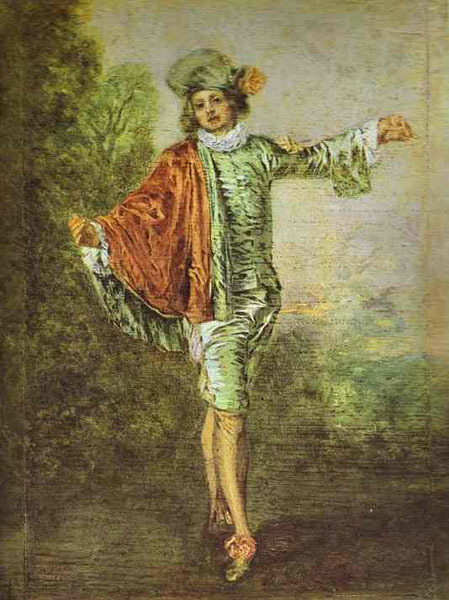 Jean-Antoine Watteau. 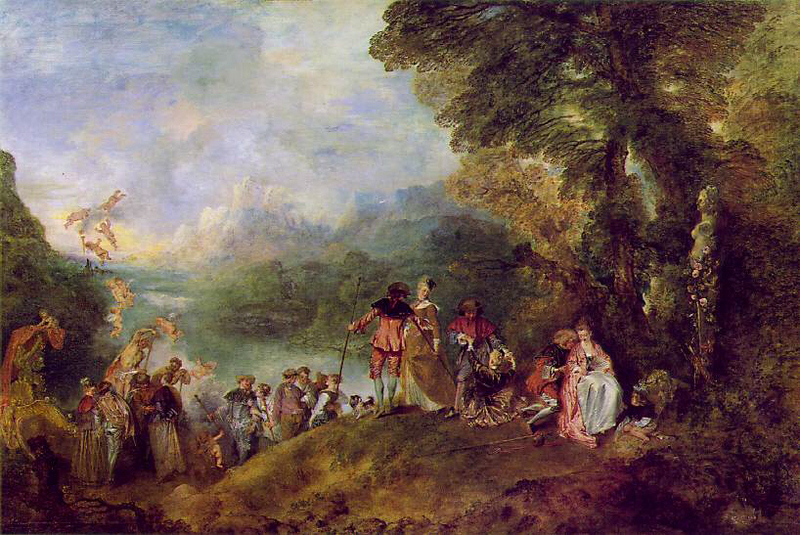 Pilgrimage to the Island of Cythera. Mi brema un poco il cor.